It's my early birthday present. J said that since he is usually about 6 months late with my presents, that it's about time he did an early one. I'd been wanting a handgun for a while now because I am crap with his... It's just too big for me to shoot accurately with. 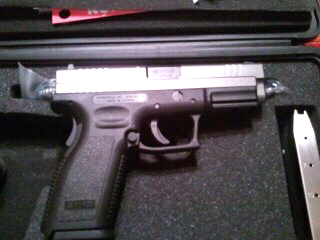 We went to a gun shop the other day just to waste time and he ended up buying me this and buying himself a new rifle. Hope you have fun on the shooting range. I've always wanted to do that some day.